In the end, I didn't use the Schimcke Ruby Red. 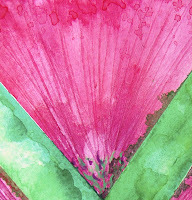 I just went with Cotman Permanent Rose and Derwent AquaTone Magenta. Brendan likes the colours just as they are. I find them a bit too brash. But maybe the best thing would be to leave this one as is and do another one with less pink? I might leave it for a few days, while I think about it. On Friday, John Kelly (on the JK Ensemble show, Lyric FM) played this gorgeous piece of music that caught my ear. I often listen to the daily replay of the JK Ensemble on the RTE Radio website (click on Lyric FM in the Listen Live section, then pick the JK Ensemble link in the window that opens - you'll need Real Player to stream the music - follow the instructions on the RTE website or download it from the www.real.com website - there is a free version, which works just fine, but it's sometimes hard to find it on their website). I really enjoy John Kelly's mix of music - some classical, some jazz, some ethnic, and even the occasional Jacques Brel. It's a 2-hour daily show, and well worth listening to. Anyways, on Friday, he played this piano solo improvisation track that I found beautiful. I've been playing it non-stop since Saturday (the replay is a day after the original broadcast). Another good thing about the RTE Lyric FM website is that they publish the playlist for their past programs, so if you hear something that you like, you can find out what it is. And I found that the piece is by Keith Jarrett, from an album called The Koln Concert, which is apparently one of the best-selling jazz albums of all times. Well, not being a jazz fan, I had never heard of him, but I'm going to go and buy that album! If you're intrigued, have a look on YouTube (just put in Keith Jarrett in the search field), where you'll find some videos of some of his concerts. Or check it out in the iTunes store. Susanne was over last night - we had a bite to eat, courtesy of Brendan (squid rings, pasta with prawns, and strawberries and ice-cream!) and we watched the DVD of Volver, Pedro Almodóvar's latest movie, which we had been planning to watch for quite a while. Volver wasn't quite what I had expected (I guess I had expected a mad funny movie like Women on the Verge of a Nervous Breakdown). It had a lot more depth, and was very moving. When Susanne was leaving, she saw a fox on the green in front of the house, and we watched it for a while, as it was following a trail very close to us. 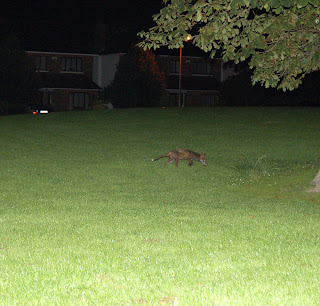 I think it was quite a young fox - it seemed to have no fear of us at all. And all the while, there was a white cat hiding under the cars parked across the road there, keeping a close eye on it. (Needless to say, Willow was oblivious to all of this - he was asleep at one of his favourite observation points: the window upstairs). The trail the fox was following eventually took it further away, but not before Brendan managed to take a few pictures! In this wet summer of 2007, we have learned to make the most of every bit of sunshine sent to us! This morning, the sky was pure blue when we got up around 9, so we sat out for an hour or so, but the clouds were soon bubbling up, so we decided to go towards Dalkey for a walk down the Vico road. The clouds were pushing in from the west, but, somehow, stopped short at the coast, and we enjoyed a lovely stroll down to Coliemore harbour. 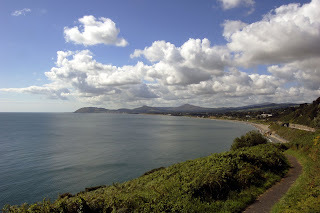 This picture was taken from the Vico road, looking towards Killiney beach, Bray and the Sugar Loaf. Last weekend, we were invited down to Ballymoney by Mick and Bláth. There was quite a bit of traffic on the way down, but we managed to get there in just over an hour I think, so it wasn't too bad. The weather was poor, and Mick had to abandon the barbecue and cook the lovely marinated chicken under the grill instead. Mick and Bláth are lovely hosts and had laid out quite a feast for us all (Niall and Rita and family were there too). Poor Stan had to stay outside, as Eve was a bit spooked by this big dog licking her face! I must ask Bláth to give me the recipe of her gluten-free chocolate cake. It was to die for! I'm still avoiding the moment when I have to set paint to paper! 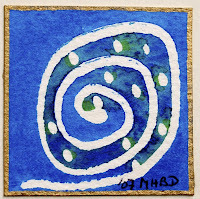 Not only have I painted a full page of 5x5 squares, with my aboriginal snails, lines and dots and little waves - my usual themes. All very useful to try out colours - I'm quite happy with the pinks. I think the Schmincke Ruby Red is a good choice - it's got enough depth, without being overpowering. I'm still not sure about my greens, though. And then, I decided to play around with textures - I'll use a wooden stick for the veins in the petals. I don't have the right intensity in the pinks at this point, so I think I'll have to either work with thicker paint or apply more layers. And then, I had fun with the greens, pouring paint, then lifting it with a tissue. It will be a useful technique to suggest the light filtering through the greenery. And my 5x5 squares make very handy birthday cards. I wonder who I'll send this one to? Maybe I'll start to paint the full picture tomorrow or at the weekend. That's if I don't get distracted with Second Life, which I've just set up on my Mac. The Sims meets online gaming. More about this later! This one is simply a copy of the photograph, with more red in it. I've been experimenting with the colours and textures. The Schmincke ruby red will be perfect I think. And I'll use a pointy stick to do the veins in the petals. And I can lift colour from the green areas to create the fuzzy background. I'll have to think of the highlights next. The ruby red I have doesn't lift too easily, so I'll have to move quickly before the paint dries. Here are a few of the variations on the poppy theme. I just adjusted the colours with Photoshop Elements. 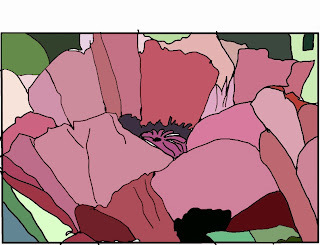 The first one was done by picking the colours from the photograph. Because it was too dull, I started increasing the intensity of the red, which I think looks a lot better. I rang you yesterday to wish you a happy birthday. I hope you had a great time at the Pirates' Den (wherever that may be!). Despite our busy schedule, I still manage to work on my watercolours. It just takes longer to get a painting finished. 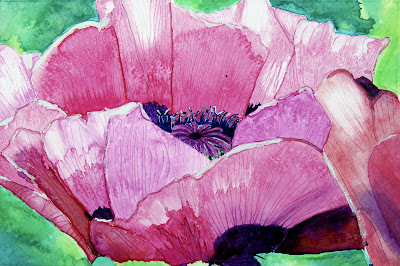 Right now, I'm working on a gorgeous purply-pink poppy. Here are 2 tracings I did on the Wacom tablet. I haven't decided yet whether I will get rid of the few petals from another poppy in the right-hand corner or not. I think I might keep them in, as the corner looks too empty without them. 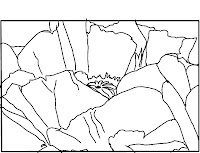 But I have to figure out a way of painting it out of focus, so it doesn't compete with the main flower. Next time, I'll show you a few of the colour variations I've tried with Corel Painter Essentials. The colour picker tool (it's like a pipette) is very handy for picking the colours from the original picture and dropping them on the drawing. But I found the resulting colour drawing a bit dull, so I experimented with it - adding more light at the top, and also increasing the red hue. After seeing that someone had got to my blog by doing a search for Aine McAteer's book, Recipes to Nurture, I decided to have a quick browse to see if she had a website. And she does! It's simply www.recipestonurture.com. Big fan that I am, I posted a comment, and got a very nice email from Aine herself this morning! Her book is sold out everywhere, so the only way to get it is second-hand I think. That's how I got it, second hand via Amazon, after Véronique had told me so much about it! Since we got this book, we've tried out a good few of her recipes. As you know, I'm more of a "baked potato with cheese and coleslaw" girl than a domestic goddess. But the recipes in her book are so easy to execute that even I couldn't resist. My best dish is definitely the apple and pear crumble, which Brendan loves! I can't wait for her next book, although I still have plenty of recipes to try from this one! On Monday, I had the window at the front upstairs open, to get a bit of fresh air going through the house. When I open the window at the back, I always open both sides, left and right, so that Willow can, if he takes the fancy, walk on the window sill on the outside and come back in the other way. 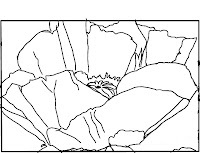 (There are 4 panels - the 2 in the middle don't open, and the 2 on the right and left open out). At the front, the panel on the left is missing a handle, so it's awkward to open and close. I generally only open that window when I know that Willow isn't around, as he fell from that window sill a few years ago, trying to walk backwards on the narrow window sill, in order to get back in. There was no harm done, except for my heart beating too fast for a good 10 minutes, and Willow's pride. Well, it happened again on Monday. I had left the window open, forgetting about it, until I walked into the front bedroom and saw Willow on the window sill, outside. When he saw me, he wanted to get back in of course. The window sill is too narrow for him to turn around, so he tried to walk backwards. And he fell! The look on his little face, as he lost his footing! I ran downstairs, and found him walking away, disgusted with himself! I picked him up to make sure he was OK, and gave him a feed of tuna (if the cat eats, then I conclude that he is not in too bad a shape). He seemed to be fine, and I kept a close eye on him for the rest of the day. Because he is so heavy, a fall can cause a fracture. At this stage, I only worry if he tries to hide behind the furniture and doesn't want to engage with us, even for food. When that happens, it's straight out to the vets! It's happened a few times after a fight with other cats - the big risk is blood poisoning from a damaged claw or from a cut. He was limping a little bit yesterday, but is 100% today, except for his hurt pride! Needless to say, I couldn't capture his fall on camera! The hosta under the window is a bit crushed! It was nice and sunny this morning, for a change, so I sat out for a little while. In the afternoon, we went to Sandycove for a walk. We decided to walk to Bullock harbour. It's a long time since I'd been there. The approach to it is not particularly scenic, as there is an old nursing home and also cheap-looking apartments overlooking the harbour. But once you're there, you forget what's behind. It's a busy little harbour - the main activity seemed to be boat rental. The place was buzzing with families and groups of Chinese or East European young men going out fishing. The sun peeped out and kept us warm, despite the cool sea breeze. The main attraction was the seals: there were 3 or 4 seals popping their heads in and out of the water, patiently waiting for bits of fish to be thrown out into the water. One of them was quite big, and, judging by the marks on its skin, quite old. There was also a little jack russell keeping a close eye on them, going as close to the water's edge as he dared, in the hope of catching a glimpse (or more than a glimpse!) of the seals. Unfortunately, we hadn't brought the camera, so I've got no pictures to show you. It was the same yesterday: we went out to Airfield and saw a fox going around one of the fields, sniffing the ground, rummaging around, minding his own business. It was the closest I've ever seen a fox. He was a very healthy-looking fox, and didn't seem to mind us one bit. While we were in France on our holiday, we went to see some of the Cathar castles, as we were right in the heart of the Cathar country. You'll find plenty about this on www.cathares.org. We went to see the castle of Aguilar (from a bit of a distance as the road looked quite twisty and I chickened out) and the castle of Quéribus (up, close and personal, despite my fear of mountain roads - it wasn't as bad as I feared!). As it looks like I'm not going to have any opportunity to wear my beautiful summer tops in Ireland this summer, I want to capture some of them here. 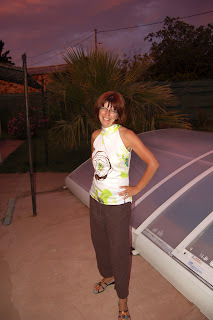 This top was also a Zara purchase in Namur (once again - Merci, Maman!). I think it's absolutely gorgeous (just ignore my red nose! ), but the weather has been so poor here that I really don't think I'm going to get to wear it this summer! I'll be posting a card today! I hope you have a lovely day. 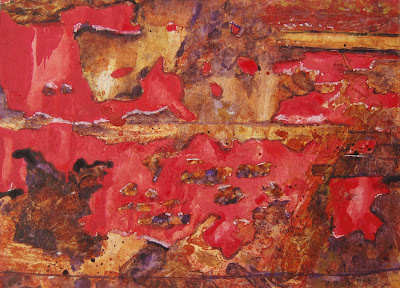 Here is the watercolour painting of a rusty boat in Connemara, well, a small patch of the hull actually. I had great fun with this one. First of all, I covered my watercolour paper with a nice layer of gesso, so that the paper wouldn't absorb the paint too fast. 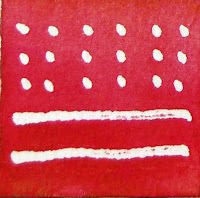 Then, I painted the red patches, using winsor red (a lovely pure red, not too pink, not too orange), dragging the paint with a tissue to create the effect of running paint. After that, I covered these patches with low-tack masking film so that it wouldn't get splattered with the other colours. And then, I used Winsor violet, quinacridone gold, yellow ochre and burnt sienna for the rusty bits. That's where the fun started: I splattered, dragged, covered with cling film, stenciled with a sponge, each time waiting for the paint to dry before applying the next colour. And finally, I used a tiny bit of white gouache with a touch of red to do the highlights where the red paint is peeling. Great fun altogether. Check out how I experimented with the techniques here. And here is a picture of the boat itself. Click on the picture and try to find the bit of the boat that I used for this painting. It's not exactly the same (I didn't trace! 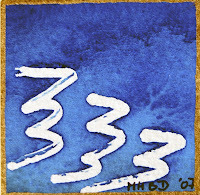 ), but the overall shapes are there. I read a few books while we were away in France. I'm not that interested in sitting out in the sun, but I do enjoy reading a good book while sitting out in the early morning sun or in the shade in the afternoon. I read Two Lives by Vikram Seth. I've read most of Seth's works - his best, in my opinion, is A Suitable Boy, a thoroughly enjoyable mammoth of a novel set in India and following a few families and exploring their relationships. I've read it twice, and I could read it again and again and still enjoy it as much. Two Lives is a very different book. It's a biography of Vikram Seth's great uncle Shanti and great aunt Henny. It's a very touching book, in particular when he recounts how aunt Henny's mother and sister died in concentration camps (they were German Jews in Berlin). I found that parts of Two Lives really spoke to me, but it was an uneven book, and Seth's editor should have advised him to cut the few pages where he philosophies about the state of the world. I think I keep on buying Vikram Seth's books in the hope of finding another A Suitable Boy, but he hasn't quite delivered yet! I also read The Da Vinci Code, by Dan Brown. It was one of the books left by previous holiday makers in the house, and I had to give it a try. Now, you've probably all read it already, so I won't bore you with the details. It was a great summer read - it had a good plot, plenty of baddies, an interesting background, and lots of twists. I probably won't read anything else by Dan Brown, as I've been told that all his books follow the same formula. But if you haven't read it yet, you'll enjoy it! Apparently, the movie is really disappointing, and I can imagine why - what makes the book enjoyable is all the background history and speculation about Jesus Christ, Mary Magdalene and Da Vinci. I guess all of this is barely touched upon in the movie, so all you're left with is a one-dimensional thriller. My third holiday book was Jewels, A Secret History, by Victoria Finlay. I had read her previous book, Colour, which I'd highly recommend to anybody who is interested in painting and pigments. Jewels is the same kind of book, this time about precious stones. It was quite interesting, even to me, who is not into jewelry at all! And the last book I read was My Sister's Keeper, by Jodi Picoult. I always keep the best til last, and this is definitely the best book I've read in a good while. I had never read any of her books, and now I want to read all of them! (and thanks to Mary, I have a couple more of her books to read now!). My Sister's Keeper is the story of Anna, who was born for the purpose of helping her sister, Kate, fight leukaemia. It's a very good story, full of heart, and it definitely brought tears to my eyes. Right now, I'm reading The Island by Victoria Hislop, loaned to me by Mary. And talk about coincidence: I was giving training to a customer on Thursday, showing her how to transfer her pictures from her camera to her computer. Her pictures were from a holiday in Crete - I could not believe it when she said "and that's a picture of the island across the bay - it used to be a leper colony". 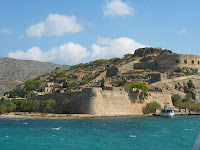 This was the island that the book is about, Spinalonga. And it looked exactly like I had imagined. There are some good pictures on the Victoria Hislop website, by the way. When I was in Belgium in May, Mum bought me a lovely top in Zara in Namur, and then we found sandals in the Routard shop in Charleroi airport that were just a perfect match for the top (Merci Maman!). I was looking for brown trousers to go with the outfit, but didn't find anything in Namur. Luckily, I found exactly what I was looking for in Fifty Three Degrees North in Carrickmines. 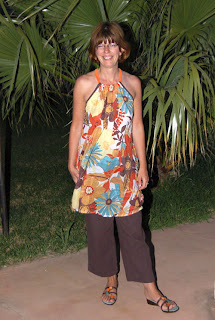 And here is the resulting outfit, which I think is gorgeous, and which I wore in Montséret. A pity the weather is so bad in Ireland and there is no opportunity to wear it here!